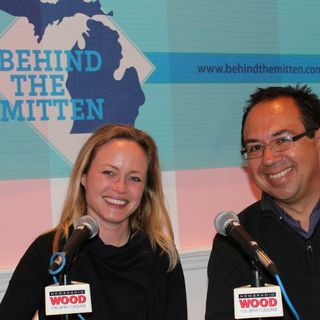 Recorded Nov. 24-25, 2014: John Gonzalez and Amy Sherman are co-hosts of "Behind the Mitten," a podcast about Michigan beer, food, festivals and the people who make it all happen! Today's episode finds Amy and John broadcasting from Perrin Brewery in Comstock Park where they talk to Terry Vanden Akker about the brewery's first bottled releases. John and Amy also talk Thanksgiving & Beer pairing with reps from Beards Brewery and Short's Brewery. And they bring you ... Maggiori informazioni details about Right Brain's CEO Stout Day (Nov. 29) with Phillip Davey and Jeff House. Then, Amy talks Thanksgiving dinner with Chef Andy Holiday of Selden Standard, a seasonal, shared plates restaurant in Midtown, Detroit. John wraps it up with Paul Starr of I'm a Beer Hound. They broadcast from Horrocks Market in Lansing and talk about upcoming events.